While dreaming of your holiday in Greece you’ll likely want to book one of the many Greek island cruises out there. I’ve put together a list of some of the best. One of the travel experiences I always highly recommend in Greece takes you out to sea. Greek island cruises, sailing excursions and boat trips are just amazing experiences because the sea here is amazing. 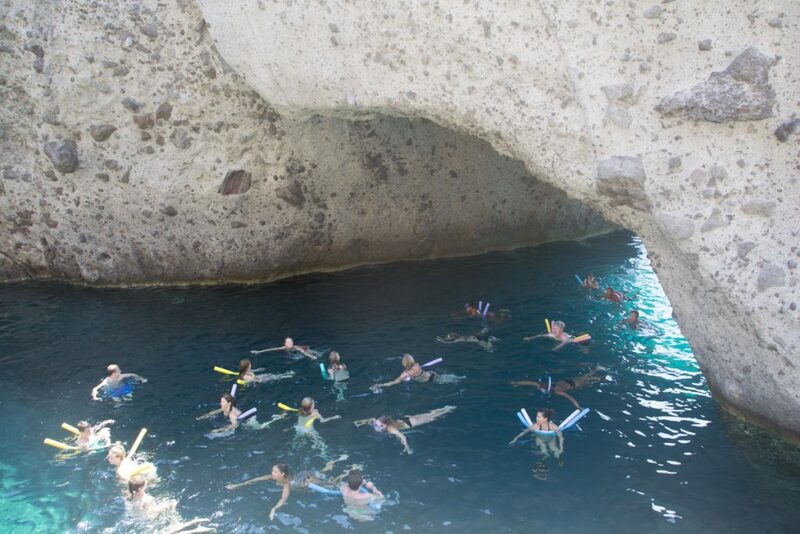 The baby blue, turquoise and crystal-clear waters will put you in awe. After eight years of traveling this country, I am still surprised at the beauty you can encounter. Each island is unique too. You just have to see for yourself. 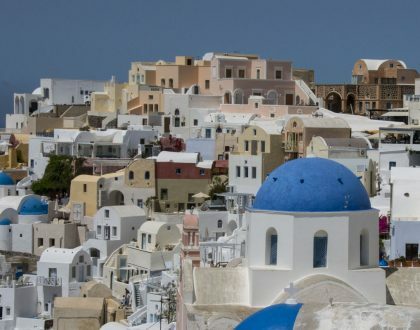 So, if you are planning to be in Greece, here are some day cruises to consider whether you are in Athens or one of the beautiful Cycladic islands. Disclosure: Note there are some affiliate links below, but these are all travel experiences that I highly recommend. I won’t put anything on this post that I haven’t verified or experienced myself. 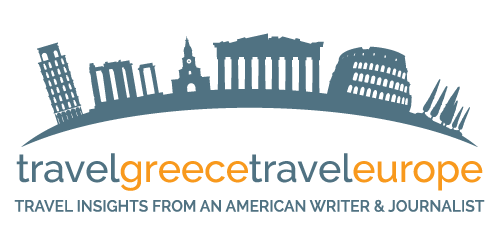 Plan to be in Athens but still want to see a Greek island? Consider this. 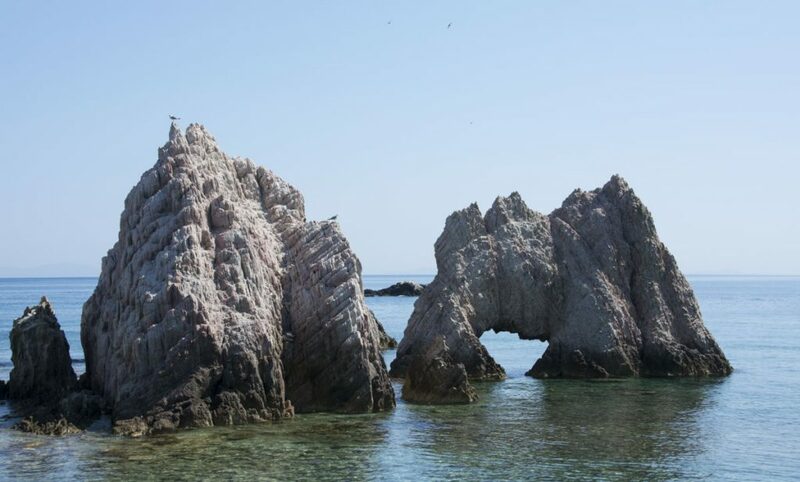 Did you know there is a chain of beautiful Greek islands, called the Saronic islands, that are a stone’s throw away from the Athens city port of Piraeus? Okay, not a stone’s throw but close enough that you can see three – yes, three islands – in one day. 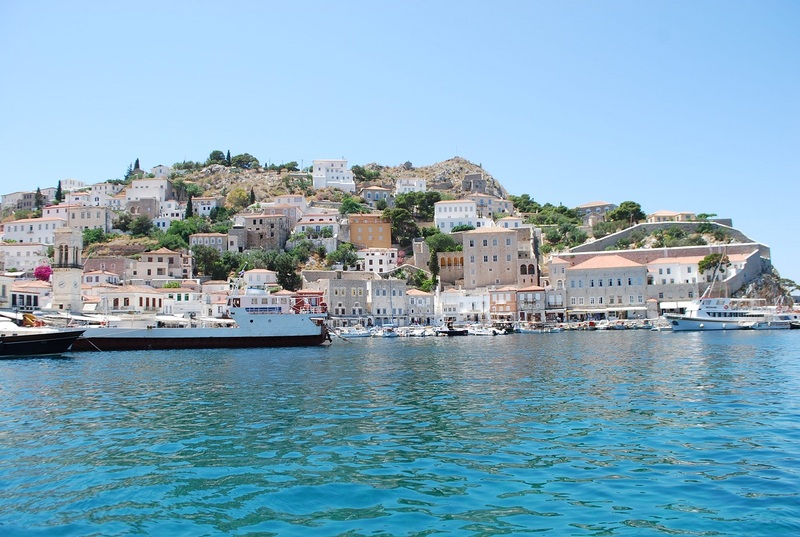 Hydra is captivating and near Athens. I’ve taken visiting friends on this day-long cruise which stops on Poros, Hyrda and Aegina. It’s a perfect way to get a glimpse of the Saronic islands in a short amount of time. The cruise boat is efficient, you can enjoy the view of the sea and the crew plays live Greek music on the journey. The price also includes a Greek style lunch buffet. Ahh, Santorini. I will forever love returning to this amazing destination. 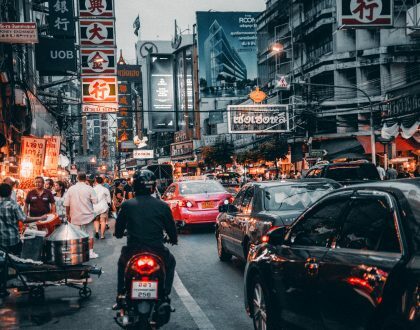 While, yes, it may be one of the most touristic and popular islands – there is good reason. It is a stunning place to be. Check out these tours that will help make your experience even more beautiful. Like the sound of hiking a still active island volcano? You can do it on Santorini. 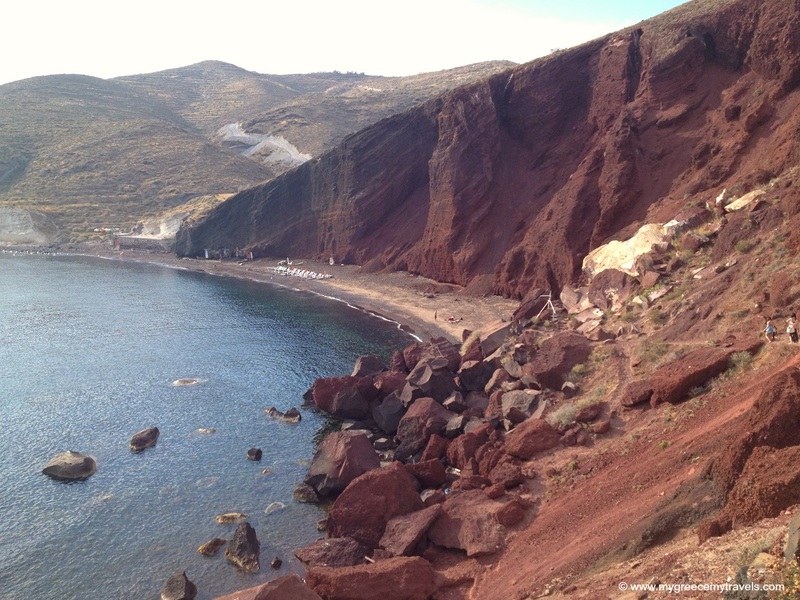 This tour takes you up to Nea Kameni where you can feel the energy. It’s totally safe! But hot. The boat then goes onto Palea Kameni where you can dive into the island’s emerald green but hot coaxing springs. The third stop takes you to the isle of Thirassia where you’ll see another face to the Santorini archipelago. The island of Thirassia will be a third stop. The finale of the day will be sunset experience in one of my favorite corners of Santorini: Ammoudi Bay. Your boat will dock here to watch the famous Santorini sunset blaze down. It’s so beautiful you very well may clap at the sight along with everyone else. This is a morning cruise on the Manolios that gets you to the highlights of the Santorini’s archipelago. You’ll be back by the end of the morning to continue your day. First stops are the Nea Kameni volcano where you can climb the volcano and take pics by its crater. That workout will deserve a refreshing dip at the next stop: the emerald green Palea Kameni hot springs. From 36 euro per person. 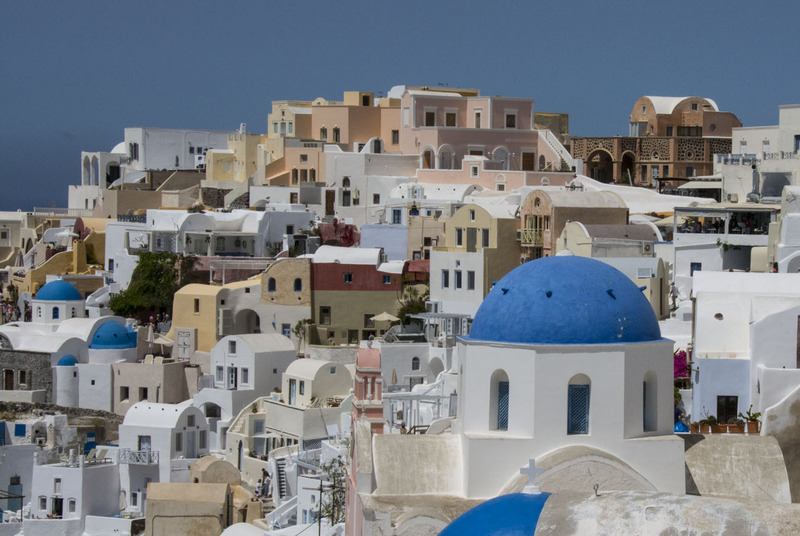 Book this morning cruise here: Santorini Volcano and Hot Springs Discovery Cruise. Truth be told, Santorini is not known for idyllic island beaches with swinging palm trees and powder gold sand. It is known for unique volcanic rock beaches that are beautiful in their own way. On this tour, you’ll cruise to one-of-a-kind beaches that are best accessible via boat including the White Beach, the Red Beach. If you love unique beaches, Santorini has them and this tour is the best way to go see them. 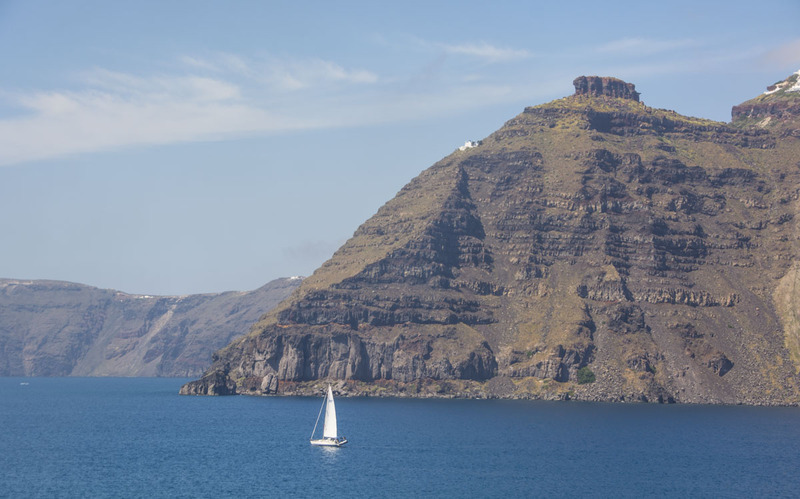 Here’s another way to sail around Santorini. The King Thira boat starts out from Kamari to take you on a lovely dinner cruise. A buffet dinner is served featuring Santorinian specialities and delicious Greek dishes. While the food will be good, so will the view. The boat makes a point to stop at picturesque spots. After sunset, you head back to Kamari. 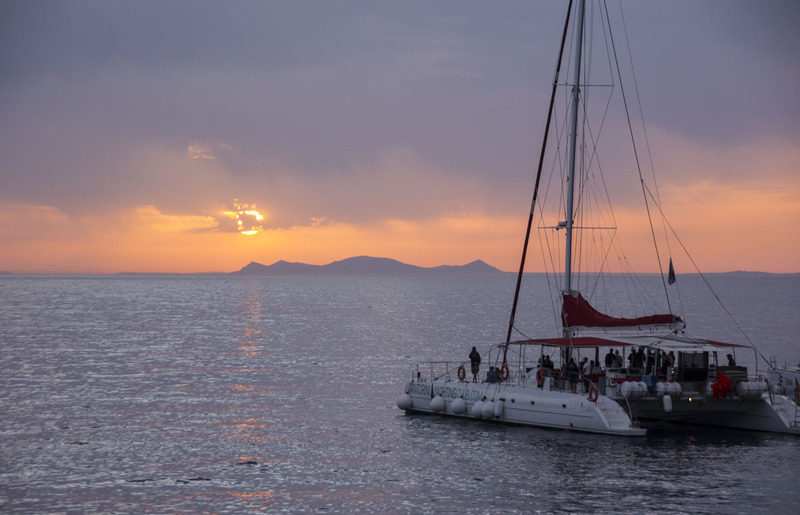 This sunset tour departs from Mykonos to nearby Delos, a fantastic archaeological site today which was once a mystical and revered island for the ancients. Then, the boat will cruise along close to the shores of Rhenia and the small islands of Ano, Kato Rematiaris and Prassonissia. There are drinks and snacks served on board. You’ll end the trip enjoying the Greek island sunset from the boat. 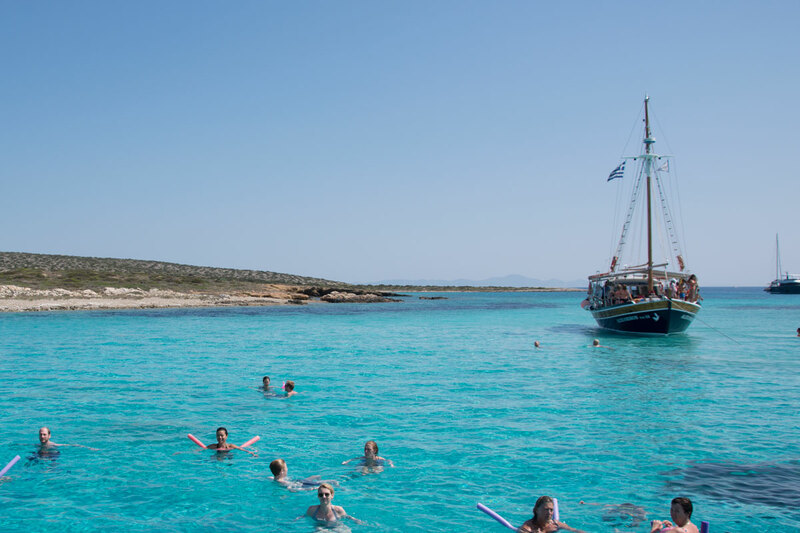 Take this sailing cruise to discover the southern coast of Mykonos which is where the most beautiful beaches can be found. From Ornos Bay, you’ll sail to Dragonissi, an uninhabited island known for the beauty of its shoreline and caves. You’ll also head to various beaches, enjoy a coffee break and have the chance to try out some water sports. Lunch is also served on the boat which includes Greek favs such as olives, tomatoes, tzatziki, dolmadakia (stuffed grape vine leaves), meatballs, Greek beans and cucumber salad. 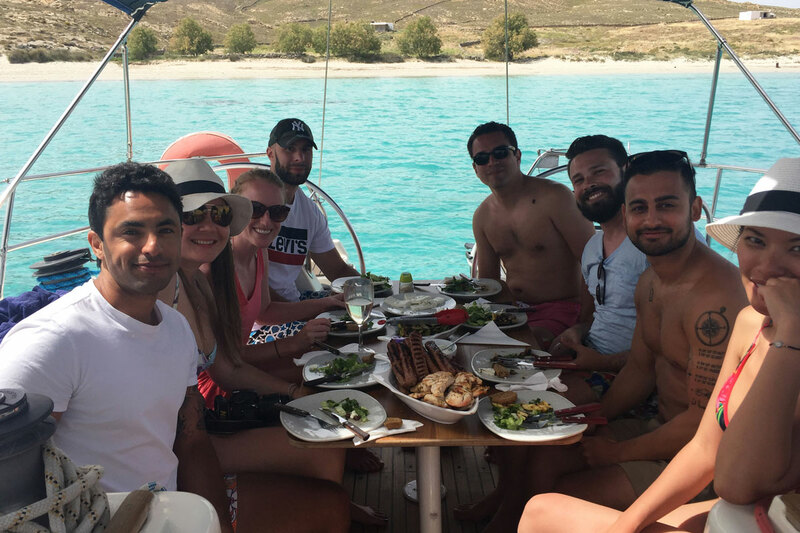 I loved my experience cruising with Captain Artemios with Mykonos on Board. His sailing cruise only fits up to 8 passengers so you get a more intimate experience. You’ll sail around Mykonos and you’ll get a bit of ancient history, a glimpse of uninhabited neighboring isles, hidden beaches and incredibly azure waters. It’s a relaxing way to spend the day. A delicious freshly grilled Mediterranean lunch is included as well as wine, ouzo and refreshments. From 100 euro per person. Check out my experience from my earlier post: Sail Around Mykonos: Delos and Rhenia. 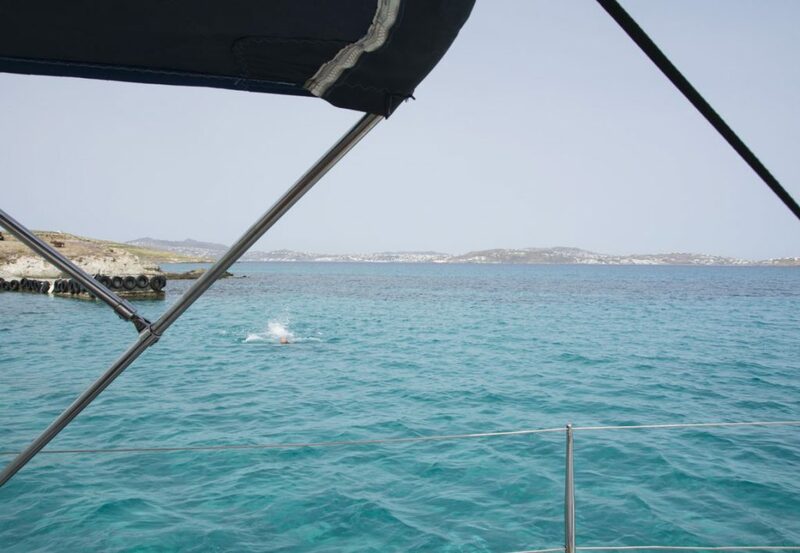 On Captain Ben’s sailing cruise around beautiful Antiparos you’ll discover just how amazingly pristine and turquoise the sea is in Greece. He makes several swimming stops and everyone jumps off the boat or slides down a slide! He also breezes by picturesque caves and rocks. There’s a stop at a secluded beach. 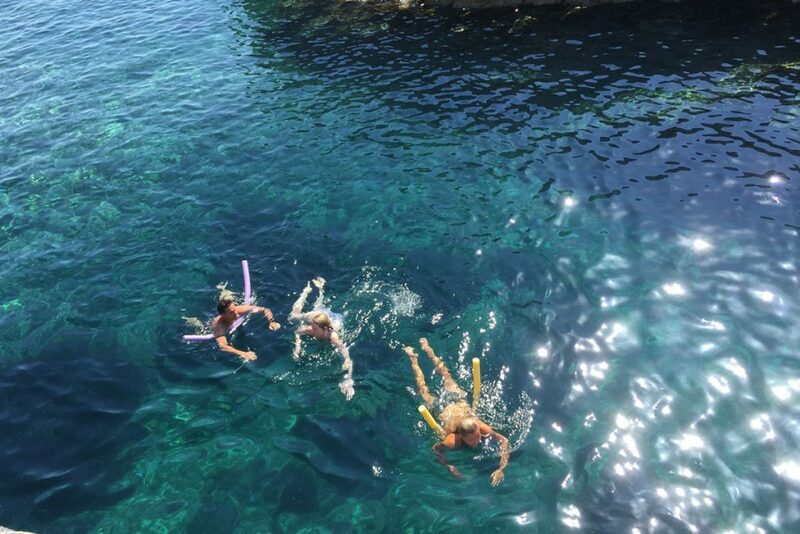 The best stop is the Blue Lagoon. The name says it all. A tasty and freshly prepared grilled lunch is served on the boat too. 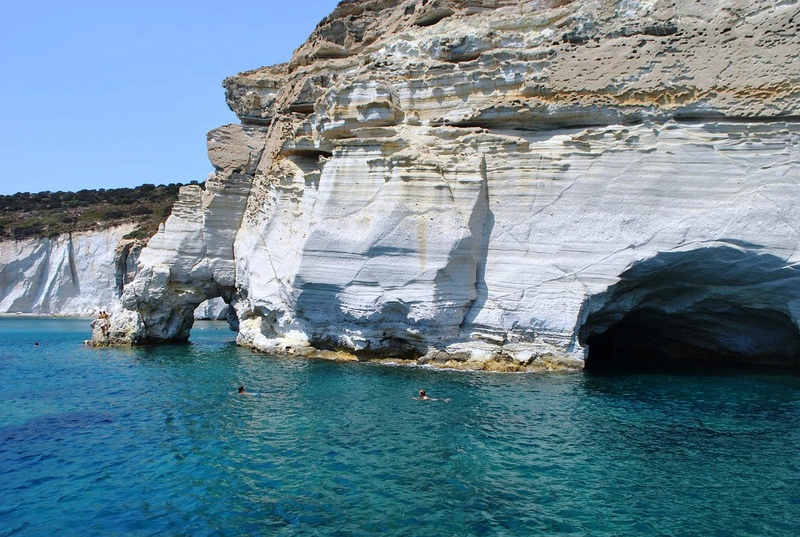 This tour offered a beautiful catamaran day trip around Milos. 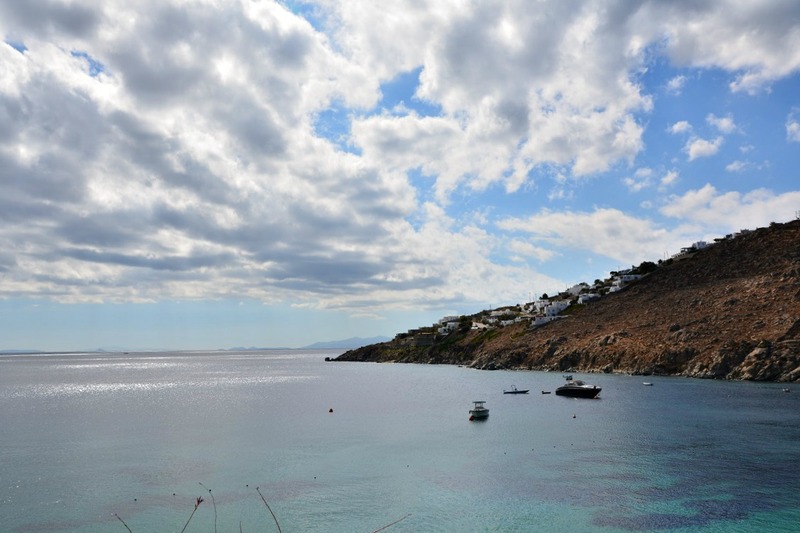 Milos, if you don’t know, is a hidden beauty in the Cyclades. There are fantastic volcanic beaches and idyllic beaches. The best swimming spots are best reached by boat. Lunch is included. Captain Nikos and his crew are just great. From 80 euro per person. 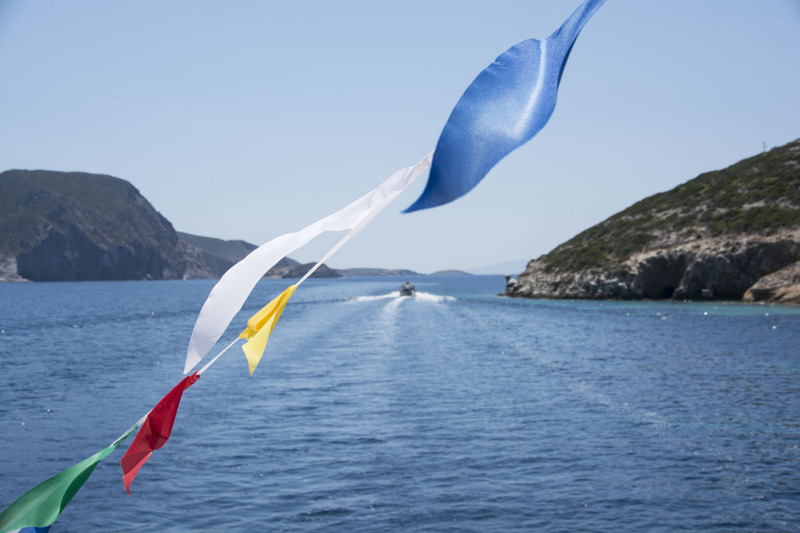 Check out my full post about the experience: Sailing Around Milos. That sums up the best Greek island cruises I can highly recommend. 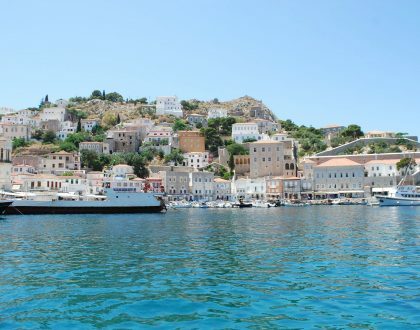 Have you ever been on a Greek island sailing trip? I’d love to hear about it! Feel free to comment in the boxes below. Hi Steph, Oh, nice! Glad you went out with Captain George. He’s great. Yes, definitely biggest tip is to take your sunblock on the boat. Good advice. There are just so many beautiful islands. Unfortunately we don’t all have unlimited vacation time or budgets to see them all! A cruise is a great way to see at least a few of them on your trip. It’s so true. Too many islands indeed. If only we all had unlimited time and budgets! !